In the billiard room, with the small dog! Apparently, Jack Russells are a hot commodity! I better call nana and tell her to keep an eye on Buster. Jack Russell Terrier stolen from Pa. home. 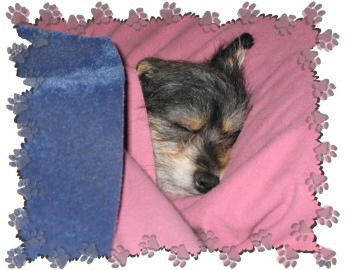 The Mystery of the missing Jack Russell Terrier solved! 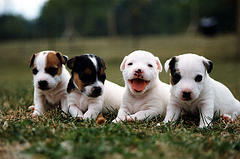 Jack Russells are so friendly and personable, it’s hard to not walk by one and want to take it home. According to the Jack Russell Terrier Club of America, “the Jack Russell is a happy, bold, energetic dog; they are extremely loyal, intelligent and assertive. Their greatest attribute is their working ability, closely followed by their excellent qualities as a companion. Jack Russell can be equally contented bolting a fox or chasing a toy in your living room, or equally adept at killing a sock in the living room or a rat in your barn. Their funny antics will continually amuse you, their intelligence seems to know no bounds and their assertive nature and boundless energy can at times be overwhelming.” Killing a sock?! Funny antics?! Chanda-Leah better watch her back! Who let the small dog out of the bag? 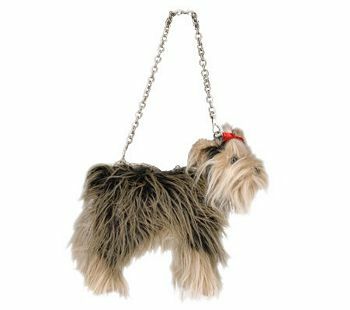 Since I don’t have an actual small dog I should probably get a Faux Fur Puppy Purse with Detachable Strap! “Makes it look as though you’re carrying a real pooch under your arm.” The Yorkie is a little too realistic. Police tie family dog to tree, then shoot. This is absolutely disgusting. I am calling Animal Precinct! I have been meaning to post on here for days but with the holiday I lost track. I have several great small dog developments to report. First, a poodle won best in show at The National Dog Show last week. Poodles, big and small, are never my first choice but the judges seemed to feel otherwise. Speaking of poodles, Stephanie made a wonderful discovery: Chanda-Leah, the World’s Smartest Dog. I don’t make this stuff up, I just report it. If you do only one thing today please go and watch a video of Chanda-Leah playing the saxophone. Please! She can perform over 1000 tricks! 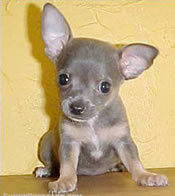 In 1999 the Guinness Book of World Records created a new category just for Chanda. “Most Tricks Performed by a Dog.” Chanda-Leah’s “uncanny ability to make people laugh is a unique ministry that is nothing short of phenomenal.” She paints, she sings, she plays an Irish jig. This website is a rare and magnificent diamond waiting to be mined. I am having trouble posting photos of Chanda-Leah but I promise, you won’t be disappointed and nothing short of amazed. More to come on this development shortly. Friday and Saturday night I watched episodes of Animal Planet’s, Animal Precinct. This show is so sad. It’s great to see the success stories though. You can watch episode extras on the Animal Precinct website. In closing for today, don’t confuse small dogs with toys! Tommrow, The National Dog Show airs @ noon on NBC. I don’t love the exclusive snobery of dog shows (i’d much rather see small dogs celebrated in all their variations), but, since this IS essentially the super bowl for dogs, I’ll have to at least take a look at the toy category, and the terriers. Go small dog speed racer, go! 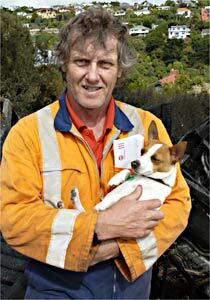 Ginger, a two-year-old Jack Russell saved the day in New Zealand. Small dog warns of blaze. Small dog got your tongue? 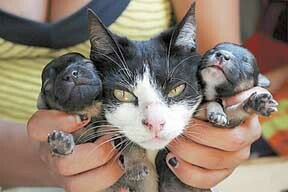 I am sure most everyone has already heard about Mimi the cat who mated with a dog and gave birth to puppycats. What does this mean for the future of small dogs? In parting, Puppy Possibly Saves Child From a Shootout in DC.